When I was at the INFINITY AND BEYOND store signing the other week I agreed to draw a sketch of Marineman on the back of their - special shop anniversary Walking Dead comic. I didn't get the time while I was at the store but managed to find an hour this morning. 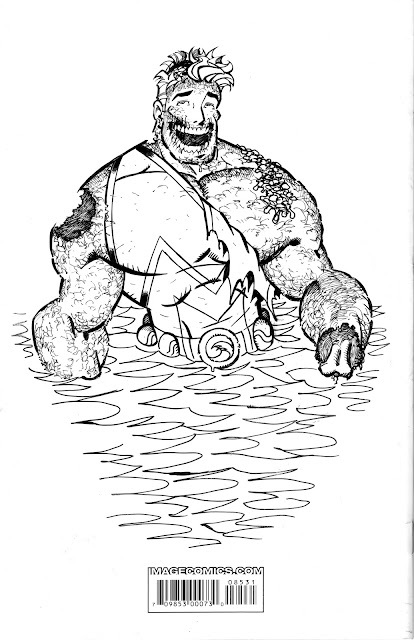 So here for the first time is Zombie Marineman - and he's still smiling even though he's undead! Click on the drawing to go LARGE! This is ridiculously amazing! I may be tempted to get a sketch like this for myself from you! Any chance you'll be attending London MCM expo next month? Speaking of sketches, how do I go about contacting you? I'd love to hang some Marineman artwork in my house. Sorry, I won't be at the London MCM but I will be at Thought Bubble in Leeds, November time. You can contact me via my Facebook page, there are a lot of Ian Churchill pages so look for the one with the photo that matches the blog. I haven't sold any of my Marineman pages yet. They are all in pencil over blue line, FYI. Not inked. I do accept inked commissions although I have a handful to get through before I can take on more, as to whether you can afford one - I don't know!